During World War II, a “Dear John” letter was a letter written to a soldier serving overseas by his wife or girlfriend back home informing him that their relationship was over. They were the break-up letters every soldier dreaded. 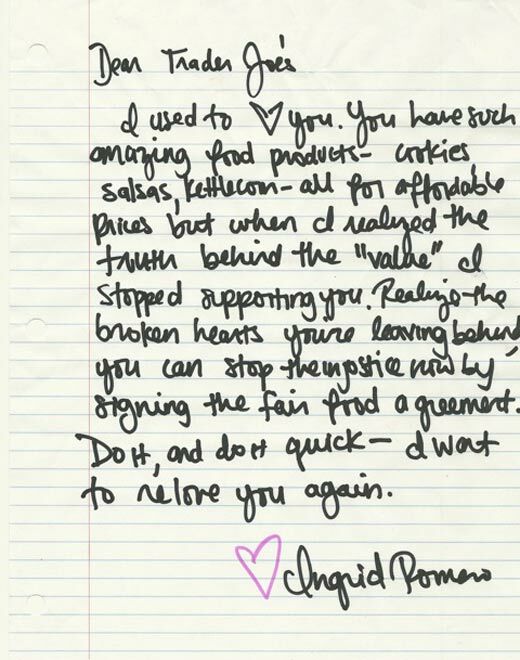 Today, a new break-up letter is making the rounds, but this time it’s “Dear Joe“, as in Trader Joe’s. Dear Joe letters, an idea started by Fair Food activists with New York’s Community/Farmworker Alliance, are a means for former Trader Joe’s customers to let the company know that they are breaking up with their longtime grocer because of the company’s inexplicable — and indefensible — refusal to support the CIW’s Fair Food Program. The letter above is one example of a Dear Joe letter, in this case by Ingrid Romero of Brooklyn. You can see more examples here. And you can write your own Dear Joe letter, too! Just click here to go to Trader Joe’s customer feedback page and use the comment space to let the ethical grocer know why you’re breaking up — and, in this case, it’s actually him, not you! Don’t miss this thought-provoking piece.